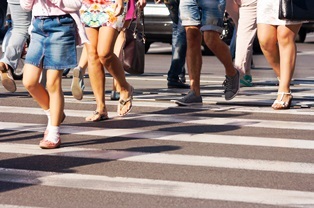 Most Common Types of Pedestrian Accidents in Florida | DeLoach, Hofstra & Cavonis, P.A. Pedestrian accidents can occur any time a person leaves the house. From crossing a parking lot to walking the dog, the threat of being struck by a vehicle—without any kind of protection—is real. However, knowing when and why these accidents commonly occur can help people of all ages avoid a crash while traveling on foot. Distraction is the top reason for pedestrian crashes. Data from the National Highway Traffic Safety Administration (NHTSA) suggests that at least some form of distraction plays a role in the majority of road accidents, including pedestrian accidents. While drivers on cell phones or texting behind the wheel are a constant danger, distracted pedestrians are also placing themselves at risk by paying attention to screens or music on their headphones instead of the path ahead. Intersections. Although crosswalks were created to allow people to share the road safely with vehicles, they're also one of the most common pedestrian accident locations. Pedestrians are often struck when vehicles fail to stop behind the line, run red lights, or turn left across the intersection. A pedestrian jaywalking or hurrying to cross the street before the lights change, is even more likely to be struck by an oncoming vehicle. Walking or running near traffic. Sidewalks placed too near to the roadway place pedestrians at risk, but areas without sidewalks at all, often prove deadly. A person walking on the shoulder may not be seen by drivers, especially on winding roads or in inclement weather. Children and school zones. Car accidents involving children can have devastating effects, and drivers have a higher duty of care when traveling in areas where children learn and play. Children may not see the danger in crossing the road suddenly or darting into the street between parked cars. Drivers in school zones should always be prepared to stop suddenly. Night driving. Researchers from the Governor's Highway Safety Association found that over 70 percent of fatal pedestrian accidents take place between the hours of 6:00 p.m. and 6:00 a.m. Accidents that happen in the dark are more likely to be hit-and-run incidents, as drivers may be unaware of what (or whom) they struck or are afraid to stop, resulting in catastrophic injuries or death for victims. Bad weather. Heavy rain or fog affects visibility for all road users, even those traveling on foot. Pedestrians may have their vision obscured by hoods or umbrellas. Drivers in these conditions may have forgotten to turn on their headlights or windshield wipers, affecting their ability to both see and be seen. Parking lots. Parking lots require drivers and pedestrians to mix together with little room between them, making this environment a perfect storm of accident risks. Drivers often back into (or over) pedestrians accidentally while moving out of a space, especially if they didn't properly check for small children or people in wheelchairs. A driver in the wrong gear may catch a pedestrian between two vehicles. Additionally, speeding in parking lots and parking structures increases the risk that a pedestrian will be run over. Even if your own actions as a pedestrian played some part in the accident, Florida law allows victims to recover compensation if someone else’s negligence was primarily responsible for the victim's suffering. No matter the circumstances of your pedestrian accident, we can help you determine who's liable for your injury. Our Florida car accident attorneys will examine the facts of your case and gather evidence on your behalf, allowing you to get the compensation you deserve for your medical bills, lost wages, permanent disability, and pain and suffering. Simply fill out the quick contact form on this page to set up your consultation. Your case evaluation is free, and we don't collect any fees until your case is won.